My apologies for being off line for a while. A few days into my trip to Turkey, the Turkish government decided to block all access to wordpress.com. Apparently someone said something on a blog they didn’t like (I don’t think it was me). It’s my prerogative as a traveler/tourist to allow myself to get lost. Sometimes it yields adventures and experiences I would never have dreamed of. Sometimes it means a longer walk. But it rarely gets me into too much trouble. And the surprises seldom disappoint. So when I started walking down from an overlook, staring down into a canyon and trying to see where the unmarked path came up again out the other side of the valley of red-tinted hoodoos some call fairy chimneys, I felt confident I could find my way out and back to my pension in no more than a couple of hours. After all, the sign said 5600 meters. How long could that take? 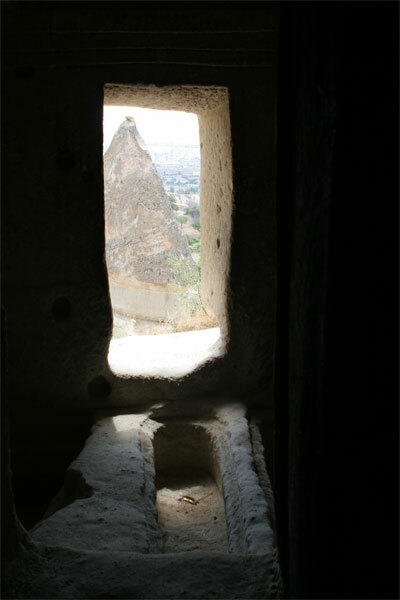 I began the hike after lunch, walking in mid-day sun down the side of the road toward Çavusin from the town of Göreme. According to the map I bought at the tourism office, which turned out to be more of a general sketch than a precise guide to the area, I knew that there was a former monastery dug into a cluster of stone chimneys to the right of the road about a mile or two down. 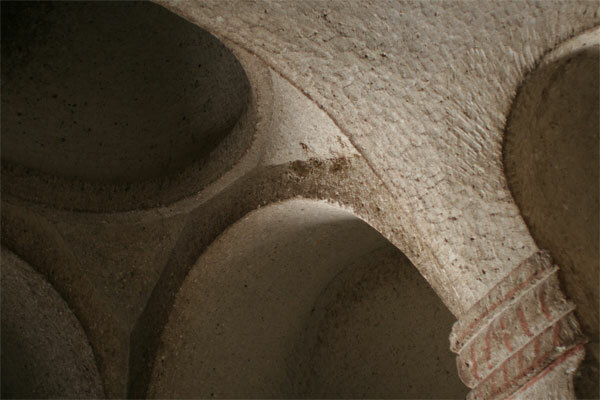 I found the area, and wandered among its various rooms, carved into the dozen or more vertical formations. 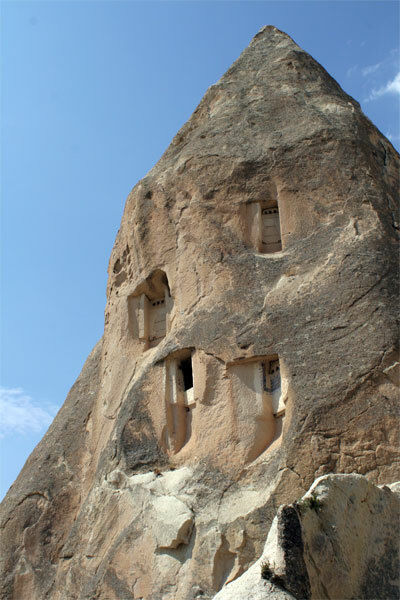 There were large spaces where monks must have lived, kitchen areas, and nooks hidden behind the rocks that led up to the rooms with windows I saw some thirty feet above from the front of the rock. It was a magical adventure among the various nooks and crannies of the formerly holy place. And then I found a chapel, where I found respite from the daytime heat, in a quiet little room. It was a modest little chapel, with tombs just inside the door (my how we’ve grown as a species…. the holes were no longer than five feet and narrow as an Olsen twin). But the amazing thing about it was I had it all to myself. I sat for long minutes just enjoying the quiet and the coolness of its cave atmosphere. And then I coughed. And I noticed how it echoed and resonated in the stone chamber. I then held a long note, the length of one breath. It rang with overtones and hung in the room for several seconds after the breath gave out. I don’t know any Byzantine tunes, so I sang what I knew of Gregorian chants and then lyrics in Latin from things like requiem masses. And then I sang Leonard Cohen. They say there was a secret chord, which David played and it pleased the Lord. But you don’t really care for music do ya? The much covered (by Bono, John Cale, Jeff Buckley, Bob Dylan and k.d. lang, just to name a few) Hallelujah. It goes like this: the fourth, the fifth, the minor fall and the major lift. The baffled king composing Hallelujah. I know it might have seemed, well, unorthodox, to the Byzantine spirits who may haunt such a place, but if I were a pastor or a priest, I would put Leonard Cohen in the hymnal. After my tranquil time in the little cave chapel, I continued down the path and into the aptly named Rose Valley. Past another church carved into the rock, the trail climbed up the other canyon wall, and it was a fun, and sometimes difficult, scramble up narrow chasms, with a little rock climbing, but the view was worth it. I was looking down into the Red Valley, with even redder rocks, overlooking a gorgeous valley of pink and crimson stones, a lot like Utah’s Bryce Canyon, only many of the conical rocks here have rooms carved into them. I continued on a couple of miles to an overlook, where I sat and had some cold water I bought from a vendor at the vista point where others had driven to take in the view. I asked him the best path down, and he pointed to a path that I could see would lead me down through the canyon again and out the other side very near where I had come in, close to the monastery. I headed down into the canyon, and enjoyed a beautiful hike on a trail that wound through caves and, in the valley below, was skirted by vineyards below stunning rock formations. But when I reached a point where I had come into the valley and made the mistake of looking at the map I had bought at the tourism office. I would do just as well to discern directions from someone’s varicose veins as I would from reading this map. 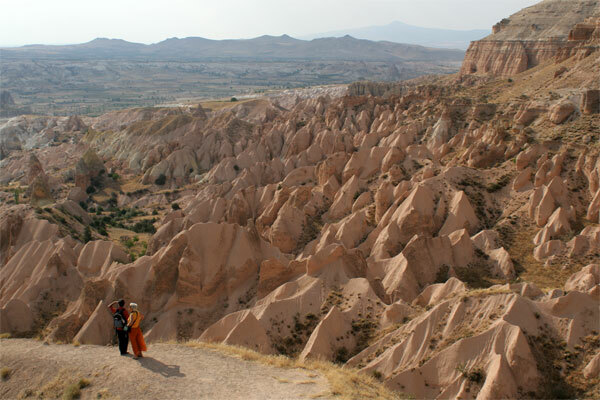 None of the trails here is marked well – so I followed what appeared to be a fairly wide road/path back toward Göreme. There were tire tracks for a full-sized vehicle, so I figured I was heading the right way. I knew it was the right direction. But as the path headed uphill, it started to float a little bit south, and I could tell I was probably going to overshoot the town by the time the trail spit me out to a road. It did. I was nearly parallel with the lookout point I had begun the second leg of this hike from. And I had to hike about three miles back to town on the road. The scenery was stunning, but my body was feeling the miles at that point. A little thunderstorm was gathering behind me as I walked, and a few raindrops threatened, so I picked up the pace. By the time I got back to town, my feet were killing me, so I ducked into the “Flintstones Cave Bar” for well-earned Efes beer (the national brand, named for Ephesus), took my boots off and, being the only one in the bar at the early hour of 8 pm, sprawled out on a bench in the dark cave and enjoyed my cold beverage. 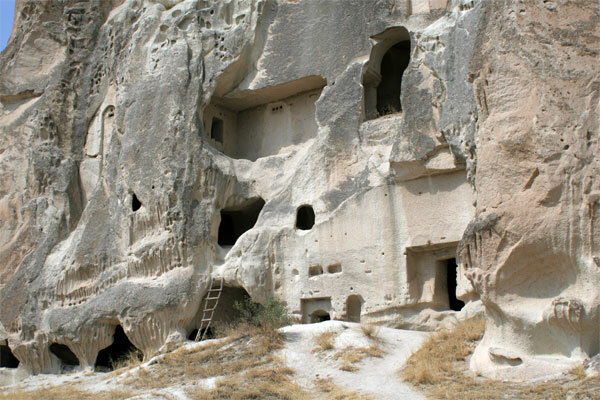 The next day, I booked a tour that would take in the green Ihlara valley, with a clear stream running among willows and pistachio trees, and various churches carved into the cliff walls. And the Selime monastery, with its cathedral ceiling rising up two stories. We also saw the underground city of Derinkuyu, which was quite a stunning feat of engineering for a simple village with no power tools. 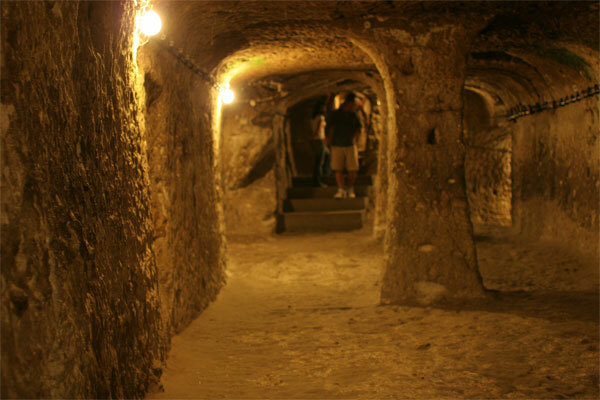 Dug into the rock centuries ago, seven levels deep, and, at its deepest levels, large, open rooms and churches and living quarters for hundreds to hide from invaders. The narrow passageways can get a little claustrophobic when dozens of tourists all try to cram down them. 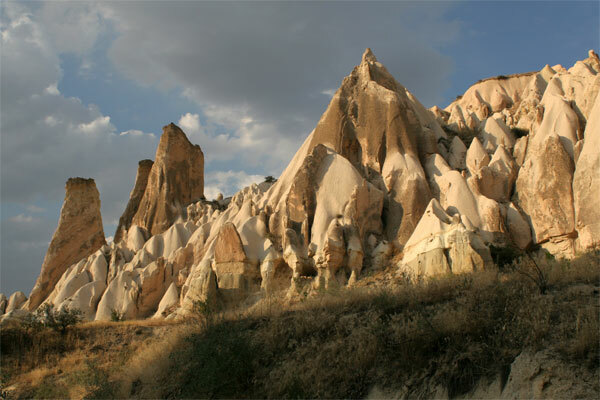 After a few days in Göreme, I faced a dilemma: do I hang out here and continue to hike in this stunning landscape? Or do I go see the big weird heads at Mt. Nemrut National Park? These are the choices we’re confronted with when traveling: Heads or trails. 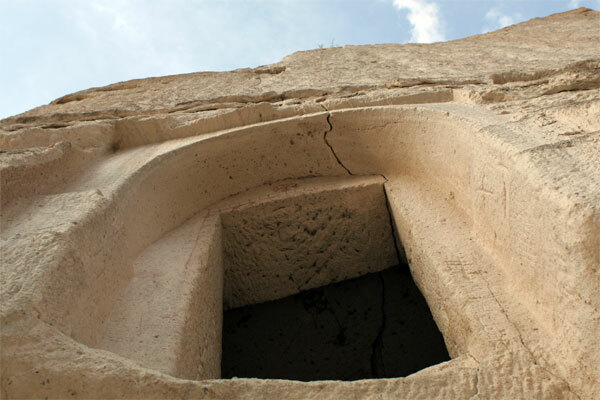 As a Canadian Orhodox Christian and a lover of Leonard Cohen’s music, I’m glad you sang his song in the little holy chapel in Cappadocia. You’ll probably never read this ’cause that was 6 months ago, but this entry of yours needed at least one comment. You’ve inspired me – maybe I’ll go there too some day, God willin’.